Gatorback logo mud flaps are the best looking and highest quality mud guards on the market! The Gatorbacks rugged design and exceptional finish make these the mud flaps of choice when you want to protect your truck from mud, rocks and other road debris. Gatorback mud flaps are the right choice for you if you have a Chevrolet Silverado, Ford F150, Ford Super Duty, GMC Sierra, Dodge Ram or whatever brand of truck you hit the road with, nothing available online today will protect your truck better! Gatorback logo mud flaps are manufactured in Canada by Truck Hardware to give your truck the best look from the highest quality mud guards on the market! 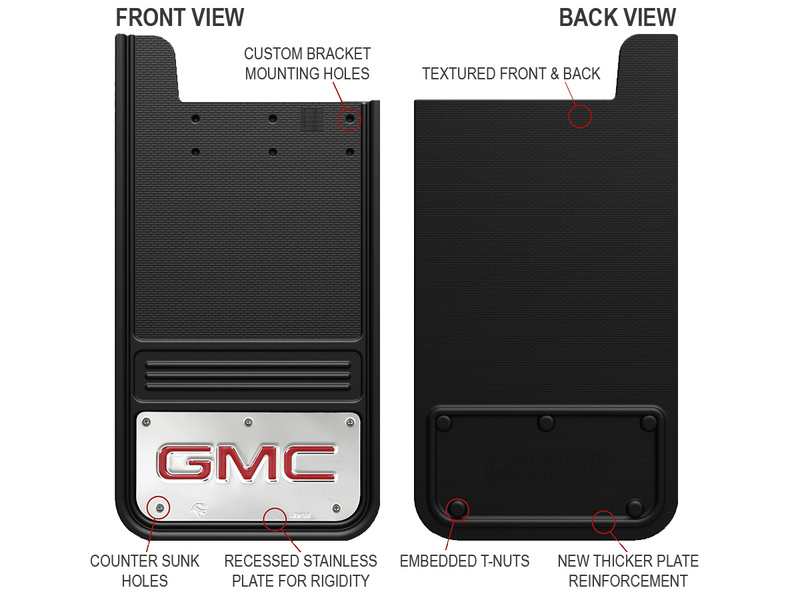 Not only are the Gatorback mud flaps functional, featuring a 1/2" thick rubber flap, but they add the style with embossed stainless steel plates that feature Officially Licensed logos from the top brands on the market, ensuring that these mudflaps will impress while they protect your investment. The Gatorback Mud Flaps are available with a range of different plates with various die-stamped logos to perfectly match the look and style of your truck! Truck Hardware Gatorback mud flaps feature a removable stainless steel plate with formed edges for strength, and hidden t-nuts. The cold formed 304 stainless steel plate is die-stamped with official licensed logos and is availble with a variety of finishes... Stainless Steel, Black Wrap or Gun Metal. So, what exactly do you need for your truck? Many of the most popular styles of Gatorback Logo Mud Flaps are now sold in packaged sets that include front & rear rubber mats and custom fit mounting brackets for a perfect fit to your pickup truck. Find available combo mud guard sets in the various logo styles listed below.